I will admit, the fact that I am a Potterhead may have seriously prejudiced me about liking the book. So yes, I really, really enjoyed it and think its brilliant. The stories are very engaging and witty (and dark, if truth be told). I found the "The Fountain of Fair Fortune" especially romantic and the "The Warlock's Hairy Heart" particularly disturbing. Then again, so were the Grimm's Fairy Tales. "Babbitty Rabbitty and her Cackling Stump" reminded me a little of The Emperor's New Clothes. If JK will decide to publish all the stories she originally thought up, this will really be yet again a lucrative series for her. After all, at P550, the book IS expensive considering it only contained five stories. And am not sure if they will ever issue it in paperback form. Still, considering how expensive kiddie storybooks generally are, its also actually not remarkable in that area. Baby Einstein books are much more ludicrously priced (then again, they're usually in thick cardboard). I really think even kids who haven't faithfully followed the Harry Potter series will find the stories here funny, and parents alike can use these stories to teach values and moral lessons. And if you juxtapose the stories with other storybooks, they aren't as fantastic that kids wouldn't be able to grasp them. I really salute JK. I cannot wait to be reading this and having talks about it with my son. 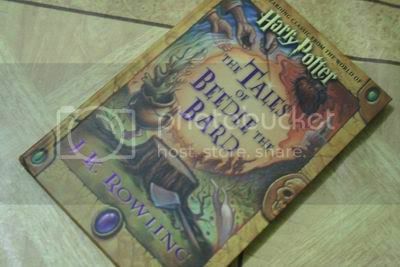 True to form, Harry Potter fans made sure that this book is the fastest selling title of 2008, selling 2.6 million copies in its first week and raking up a cool $8.5 million.